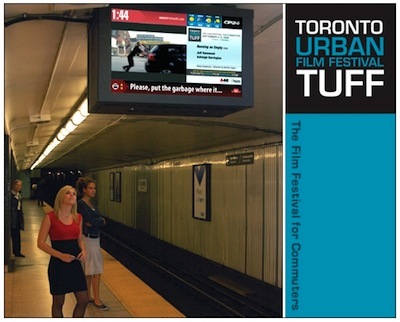 As noted in my last post, the Toronto Urban Film Festival (TUFF) has announced its list of award-winning, minute-long, and 100-percent silent films for 2010. TUFF films, produced by new and established artists around the world, run in loops on the Toronto Transit Commission’s (TTC’s) platform-level information boards, operated by OneStop Media. The boards have no speakers, proving that silent film will—by god—live on. Sometimes we have no other choice. With the recent winners on my mind, I decided I’d revisit a TUFF standout from the past. Smile, conceived and directed by Toronto-based photographer and blogger, Christos Tsirbas, won 1st place in TUFF’s 2008 competition. Now I have a few things to say about Smile, but first, have a look at this short interview I did with Christos earlier in the month. It’s always a treat to have my questions answered by the artist… hell, for me, it’s a treat when there’s somebody alive to ask. Silent Volume: Was Smile your first short film, Christos? Christos Tsirbas: I had produced two short films before. Smile was the first silent one. SV: Were you concerned about creating a film for which there would be no audio, not even music? CT: I’m coming to film from photography and writing, so the lack of audio wasn’t an issue. In fact, it was a blessing of sorts, as it gave me one less element to worry about. Although it was not a conscious choice, the absence of sound led me to integrate the written word into Smile, to get the message across. SV: Were you well-acquainted with traditional silent films before this? CT: I grew up with films without dialogue, rather than silent movies—specifically animated shorts, along the lines of Roadrunner cartoons, the Pink Panther, and La Linea. Pixar is the current standard bearer for this tradition, with the short films that precede each of the studio’s features. The latest short, Day & Night, which was the opener for Toy Story 3, is exemplary. There is no dialogue, but a snippet of talk radio that accompanies an image of a transmission tower really drives home the film’s message of tolerance and the destructive effect of the so-called “culture wars” in the United States. SV: Describe your production method and timeline for Smile. CT: I started Smile in May 2008. It took an afternoon to storyboard, a couple of days to film the various takes (I ended up choosing the second of thirty or so), and another two days to edit, colour-correct, and convert the film to the format required by TUFF. SV: Smile opens with “It’s the start of a new day/What are you going to do?” Did this statement have particular significance for you at the time? CT: The opening lines (and indeed the whole film) were a response to the sensationalism of local news. If one were to gauge the quality of life in Toronto from the reported stories (murders, assaults, robberies, car accidents), one would think we are living in a war zone. This is far from the truth and I wanted to present my version of the ‘facts.’ I’d recently read a study about rush hour commuting being one of the most stressful elements of modern life, and it made me realize that seeing bad news on the subway information screens just makes things worse, so I made this film as an antidote of sorts. Smile is a public service announcement of sorts, inviting TTC riders to lighten up. SV: Are those your hands in the film? CT: Yes they are. (I should have gotten a manicure!) The film was partly inspired by Osvaldo Cavandoli’s La Linea series of line-drawn cartoons in which the cartoonist interacts with the lead character, Agostino Lagostina, creating an on-demand reality for his gibberish-talking cartoon antihero, all the while tormenting him. SV: Smile was a huge success. Have you worked in the silent medium since? CT: I had two silent films in this year’s Toronto Urban Film Festival. The first one, Diva!, documents the transformation of drag legend Michelle DuBarry, who is so charming that words are unnecessary. The second film, Moving Pictures, is a silent movie about music and my love of recordings on vinyl. It is very much influenced by still and macro photography. SV: What did working in the silent medium teach you about filmmaking? CT: My friend Zefred Ansaldo teaches a course called “Visual Filmmaking,” during which he explores the power of images to tell stories. I learned a lot by talking to him and realized that I tend to listen to films rather than watch them. That is, I pay more attention to dialogue and score than to visuals. I’ve had to train myself to notice things like motion, colour, and editing, and this has changed the way I experience movies. TUFF has already passed its favourable verdict on Smile. Even if it hadn’t, I’d consider an official review to be slightly bad form, partly because of the interview above, and partly because the director is a friend and colleague of mine in the real world. Consider this my full disclosure. And having given it in good faith, I’m still going to tell you what I think makes Smile stand out, even among the many other TUFF films I’ve seen. I’m not claiming Smile is the best film TUFF ever screened (nor am I claiming that any one of them is better than Smile); I simply mean that Smile is as perfectly suited to the bizarre medium of a transit information board as any 60-second film around today. Riding the subway in this city can be trying. Years of budget cuts and bad management, some of it the TTC’s fault, some not, have led to a cold war between riders and the men and women who take tickets, manage crowds and drive trains. Sometimes the war erupts hot, as it did early this year, when footage of a booth operator deep in dreamland went viral. 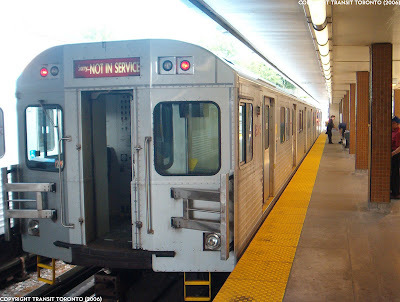 This man wasn’t typical of TTC employees, we all knew that; but neither were we satisfied with the level of service we got from our publically owned means of transportation… so he felt typical to us. We depended on this service, but it seemed to treat us with contempt. We paid for it. It ate at us. It slept on the job when we had to get to work. Thoughts like these have long rolled through morning riders’ brains in the seconds or minutes—sometimes many minutes—between their arrival on the subway platform and the arrival of the mighty, metal, shrieking beast that took them to work. For years, tensions built. Delays of even a minute seemed the stuff of intolerable incompetence on the Commission’s part—the minutes being measured, you understand, on the watches of the stranded, because until recently, the TTC did not post estimated arrival-times for trains. Truth is, the occasional five-minutes added to peoples’ daily commutes scarcely impacted them—otherwise, they wouldn’t dare risk the TTC in the first place. The impact of delays is cumulative. They affect the functioning of the transit system on a macro-level, and frankly, steaming commuters, idling on platforms, timing trains by their own handheld or wrist-mounted means of measurement, are as focused on the micro as anyone could be. No one wanted to wait. And if they had to, it better be for a good reason. And bad management, real or perceived (in moments of stress, few are charitable enough to care which), is not a good reason. A morning commuter waiting for a subway more than two minutes was apt to get irked, and that’s when he or she started looking around for distractions. Maybe they read a movie poster, or found an attractive person on the other side of the gap; but posters are over quick and even hotties can look haggard before 8 am. 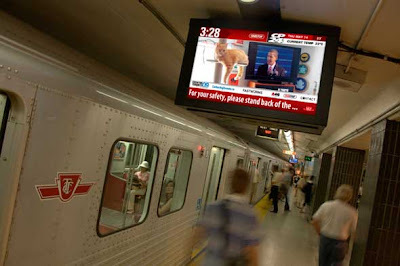 So they looked up, to the OneStop transit boards positioned over their heads. The OneStop boards aren’t big, but they can hold your attention because their information constantly changes. News; weather; upcoming events in the city; advertisements—all this will do. And for ten days a year, the minute-long TUFF films entertain on those silent, looming little boards too. Each has a minute to tell you something, make you feel something; they have you, perhaps, when you’re at your most closed-minded and surly. And there have been lots of surly people the last few years. So what does Smile do with its hiccup of time? Like Christos says, it tells you to lighten up. But it doesn’t tell you to be happy right now; it just reminds you of when and where you are happy, or could be; even if none of those places and times are here or now. Smile is no lecture—for all its brevity, its message is big-picture. It addresses men and women momentarily lost in their personal wells of misery, reminding them that the moment will pass and what’s lost will be found. It teaches by example. For me, Smile is whimsy without idiocy. Put it not in the category of high art, but in that of commonsense—the kind of truth that’s true regardless of who tells it, but better loved because of how it’s told. Click here to visit Christos Tsirbas’ blog.